By default, the Health History Form contains four sections to collect a variety of medical data. In the admin menu, you can reorder these sections to present them in any order, or make individual sections inactive if you do not wish to collect that type of information. 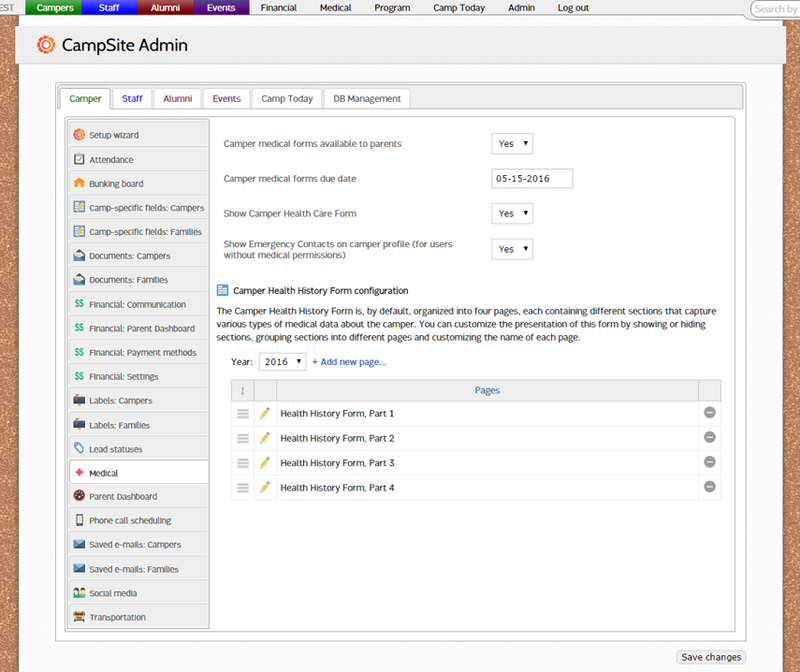 The Health History Form can be configured in Admin > Campers > Medical. It's important to configure your Health History Form before families begin completing them through the Parent Dashboard, as the form will be locked from configuration changes once they are submitted. The Health History Form configuration allows you to customize the particular sections collected on each page. To change a page of the form, double-click the yellow pencil. Each section currently contained on that page can be dragged into a new order, to a new page, or made inactive if you do not wish to collect that section. Each page can be renamed by double-clicking on the current form name. Each page can contain up to six sections. Note: Once a form has been submitted, the sections contained within that form cannot be moved to another page, but sections can be made inactive after a form has been submitted. The sections will be indicated with a lock icon when they can no longer be edited.